So I've learned this very cool thing about the city I live in. 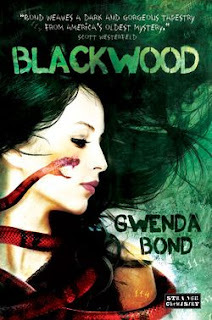 One of whom is the lovely Gwenda Bond, author of one of my new favorites, BLACKWOOD. Sidenote: Her twitter handle is @Gwenda, which pretty much means she runs the world, right? Here's the thing- she's from Lexington, she writes YA, and she's so open and friendly with a great laugh. And me being ME, I immediately thought- "SHE SHALL BE MY FRIEND." (She's reading this going, "Megan may be a stalker." I swear I'm not.) But you know, I hadn't read her book yet. So there's always that awkward, "What if I don't like it?" Which was just a SILLY concern because HOLY CRAP I loved it. I can't even tell you all the things about this book that are so great. Miranda. Phillips. Sidekick. The romance. The whole Lost Colony connection (because come on, who DOESN'T love the Roanoke mystery??). AND THE ENDING. The ending is fantastic. Miranda Blackwood, a misfit girl from the island's most infamous family, and Phillips Rawlings, an exiled teen criminal who hears the voices of the dead, must dodge everyone from federal agents to long-dead alchemists as they work to uncover the secrets of the new Lost Colony. The one thing they can't dodge is each other. And guess what. I just happen to have a SECOND autographed copy, and because I think you're cute, I'm gonna give it away. This giveaway closes Friday, October 12, 2012, at 12:00pm EST. I'll use random.org to pick a winner from the comments. Come back to see if you won! Random.org chose #10, which is Jeigh!! I'm so excited because Jeigh mentioned one of my most favorite books of all time and I NEVER hear anyone talk about it anymore! Jeigh- I'll find you on Twitter! Congratulations! Thanks to EVERYONE who entered. I love love love hearing about your favorite books!! Dahlia has the best recs!! I always think she's read EVERYTHING, at least in contemporary. Hold upa a scond Megan, but JohnI Green hadfor the bestfor young adultand novel ofto all time! Damn, that is a tough one, but in doing a mental check, LOOKING FOR ALASKA has to be the novel that made me fall in love with the novel. John Green created a slew of characters that I couldn't get enough. I still get emotional and teary when I think about it. The Book Thief, I will have to say. I seem to compare everything I read to it, and few books stand the comparison test. Great giveaway, thank you! This one's in my pile to read! That is a tough question! I think I'd have to say the entire Harry Potter series, of which The Half-Blood Prince was probably my favorite. I've only read one HP book, but I an all of them. I just need to sit down and read them all! The one I read was incredible. You really did me in when you said "of all time". There are so many good ones! I'm going to have to go with the one I've read the most, so City of Bones by Cassandra Clare. Swoon worthy LI plus fantastical setting and characters! I haven't read that! I'll add it to my TBR list. I am never good at choosing just one of anything, but A Wrinkle in Time is probably on my all-time favorite list. It's my Calgon of books. This will make Leigh Ann Kopans so happy! OMG. "Of all time" is just MEAN. I consider the HP books to be MG, mostly, so those are out, IMO. After that, uh, maybe the Hex Hall books? Gah. Just MEAN, I tell you! And, I have also met the amazing Gwenda and she is awesomesauce. I love the Hex Hall books!!! A Wrinkle in Time. I should have just let you make that entry for me. BUT I will say that I would LOVE to read Blackwood because I LOVE STRANGE CHEMISTRY and I think everything they put out looks awesome. So. Gwenda has said so many good things about SC. They'd be great to work with! Jellicoe Road by Melina Marchetta. So many FEELS! I've heard such great things about that book! I Capture the Castle by Dodie Smith. It's old, but OHMYGOSH Stephen Colley. And I want you to know, the only reason I'm willing to whittle down my soul and pretend I only have one favorite book of all time is because I want to win. So, see what you can do about that, please. JEIGH!!! That is one of my most favorite books. Usually when I mention it, no one has heard of it!! My favorite of all time is The Giver, but I think that's more MG and GAH how to choose YA!?! I guess since I HAVE to pick, I'll say the Uglies series because I have read those over and over and over and now will probably have to go read them again because they are just SO GOOD! That's another series I haven't read because I keep thinking I don't have time to read a series (I get obsessive and MUST READ ALL AT ONCE.) But I've heard great things....so maybe I should check them out. Am I a sell out if I say HUNGER GAMES? I SWEAR ON MY DOG'S LIFE I read it before the movie came out. Like an entire year before. I spent major parts of the movie shaking my head saying "What? Why...no...not exactly...Okay that part's right." And I read the whole series in two weeks. I bought the third book THE SAME DAY I finished the second one. Girl, I didn't read them til after the movie came out, and I don't think you're a sellout at all. Those books were AMAZING. I read all three in like, four days. OB-SESSED. I still haven't seen the movie though. Favorite Fictional Boyfriend of 2012: COREY LIVINGSTON in What Happens Next by Colleen Clayton (a boy that bakes...mmmmm) - out tomorrow!!!!! *P.S. It actually could. Mullin did all the research and consulted geologists, too! I'm sure I'd probably answer this question 8 different ways depending on when you asked me, but this morning, I'd say A GREAT AND TERRIBLE BEAUTY by Libba Bray. Beautiful prose and strong, flawed characters - it really brought me into the YA fold. I own every Libba Bray book BUT that one. I need to check it out. I stabbed an imaginary pin in my list of favourite books of all time and it stuck in between Anne of Green Gables and The Witch of Blackbird Pond. Anne of Green Gables. Now I'm going to hit submit before I change my mind! I very nearly answered Anne of Green Gables too!! ok, so basically, until I found out you were a write, I had no idea what YA was. I had read tons of it and enjoyed it, but I had no clue that t was a genre. Back in 1999 when I graduated from college with my English degree, it was not one of the genres we covered in class. However, upon doing an online search and reading the comments, I realize I LOVE YA!! I love anything by LM Montgomery. And Jane AUsten (is she YA?) And of course I love the Hunger Games. And the whole Wrinkle in Time Series. But my newest YA book I read is Peaches by Jodi Lynn Anderson. I loved the friendship in this book and how real the characters were. I haven't read Peaches! I'll look for it. also, after re-reading my comment, I realize everyone now is wondering where in Hades I recv'd my English degree because that comment is chock full of grammatical errors. In my defense, a 2 year old was in my lap while I was typing. I have to go with Hunger games as well! I just couldn't put it down, blew through ten in 4 nights to race to the end. The only problem when I do that is the disappointment when I realize I've reached the end! YES. I put off reading the books until all three were out, but then I read the whole trilogy in 3 days. Amazing. Ummm....I have no idea. Favorite ever? Ugh. How about recent loves? I loved Grave Mercy by Robin LaFever. Great characters, great action, great love story. Favourite YA of all time is probably KATYA'S WORLD. Got an ARC copy recently and I couldn't put it down! My favorite young adult novel of all time? That is a super hard one! I think I'll have to go with The Hunger Games, though. I read the books as it came out, and they were amazing. Although I love each book for different reasons and I love Catching Fire especially, I think my favorite one out of those is Mockingjay, which contributes the most to the reason why I love the series. They aren't just a series, and they aren't just books. They are so much more than that. They portray such a deep message about humans, society, and who we are that I don't think enough people understand. There's so much symbolism within the books, and they themselves as a whole symbolize so much more. It explores the destructive nature of humans, as well as the ability to love, forgive, move on, and rebuild. No matter what happens, we push on. It also says a lot about the path that we're on as humans, as well. I'd say more, but I need to go do homework for school! Whoever says no school equals no work is fooling themselves. :) Thanks for doing this giveaway, though! The Hunger Games trilogy is amazing. I think the first book is my favorite, personally. "Listed in YA today, but not YA when it came out because that was 1912 :) Goes to show YA is just a category, marketing, and says nothing about the quality or level of work." You know- that's one of those books that I know I'll like but I've never gotten around to reading it. Thanks for reminding me of it!